Located in the heart of Manhattan’s theater district, this apartment is within walking distance of several Broadway theaters, restaurants, subway stations, bus stations, & pubs. Times Square, Radio City Music Hall, Rockefeller Center and Fifth Avenue shopping and many other tourist attractions are just blocks away. RATES: RATES VARY BY SEASON. Maximum occupancy: 3 - extra charge of US$25.00/night for 3rd guest. Cancellation Policy: 30 days (100% refund) 14 days (50% refund)existing beds. Living Room : Panasonic 26” Flat-screen LCD HDTV (HDMI), Framed Artwork, Seiko Pendulum Wall Clock, Coffee Table, Air-Conditioner, Heater, Computer table. Bathroom : 1 Bathroom, Hair Dryer, Toilet, Combination Tub/Shower, Bath Towels, Hand Towels, Wash Cloths, Toilet Paper. VIDEO ON DEMAND OR PAY PER VIEW IS NOT INCLUDED. UNTIL YOU ARE READY TO LEAVE FOR THE AIRPORT! Please note: Actual apartment images & features including furniture, fixtures, colors, configurations, etc may vary. 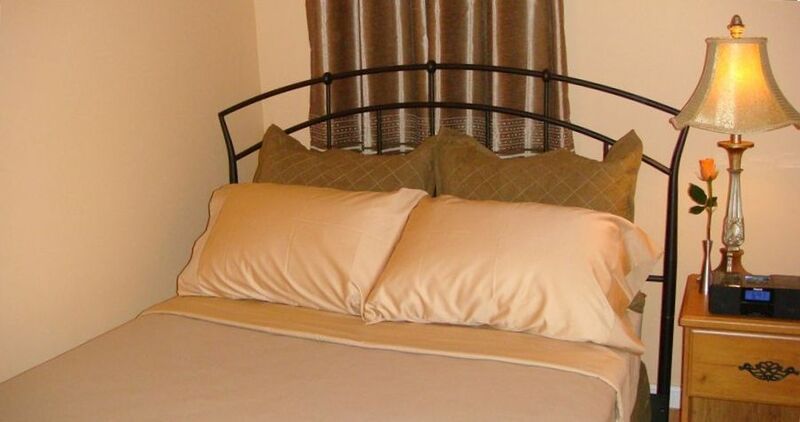 This property is perfectly located near theaters and Times Square. It is in the middle of everything and I was able to easily walk to a number of NYC big attractions. The property itself was comfortable and had everything one would need to have a great experience. Highly recommend this property. The apartment was perfect for our stay. No frills but clean and comfortable. You’re only a block away from Times Square and right in the middle of all the broadway shows. Plenty of towels, coffee maker, toaster, and a few dishes made it easy for us to order a few groceries for our breakfast in the apartment. Easy check in and out. All in all a great stay! Thank you for choosing to stay with us for your vacation and for the time you took to write your comments. It will not only help future guests, but it helped us as well. We hope to welcome you back again! I stayed from December 13 to December 17 2018 just got back home. This was my first vacation in a very long time, and I'm so happy I found this place, it's super clean, comfy, cozy has everything you need and more, but most of all the location is FANTASTIC. If you are looking for a place to stay in New York this is it. I want to thank you for your very positive review of our apartment. It will not only help future guests, but it helped us as well. I'm glad you enjoyed the surrounding areas and we hope to see you again! Two very experienced older (late 60's) travelers who have absolutely nothing negative to say about this apartment. Very clean, well maintained, perfect location, excellent price, convenient checkin and checkout. If you're browsing and find this apartment be aware the reviews are accurate. This is the place to stay. Thank you for our enjoyable 5 days. We will be back! Thank you staying with us and for sharing your experience with us. It always gives us great pleasure to hear our guests are happy and taking home nice memories. We hope to welcome you again soon! The location was perfect, the room was clean. This is the perfect location if you want to be close to time square and within walking distance of all of the plays. It is also walking distance to Rockefeller Center. This was our first trip to New York and we loved it. Thanks for everything. Thank you for choosing us for your recent stay in Manhattan. We are delighted that you have enjoyed your stay with us. Also, thank you for your very nice feedback. It will be great pleasure to welcome you again. Loved the convenience of being close to everything. It is in the perfect location to Times Square and all of the broadway 🎭� theatre shows. Thank you for your nice feedback. We would also like to thank you for choosing us for your recent stay in Manhattan. It will be a great pleasure to welcome you again.